The ramon tree is a highly nutritious member of the fig/mulberry family, and has been a nutrient-rich food of the Maya civilization in the Central American rainforests for thousands of years. 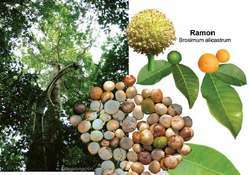 At 130 (45m)feet tall, ramon trees can produce 150 lbs of nuts per year! Referred to as the "corn tree" by the Maya, its nut was a staple food crop, capable of being stored for lengthy periods of time. The entire plant is edible. The leaves and the whole fruit can be eaten right off the tree. The nuts make a wonderful coffee substitute with a chocolate flavor. The fruit is a large seed covered by a thin, edible, tasty, citrus-flavored orange-colored skin.The fruits have zero fat and are gluten-free, and are used to make gluten-free flours, which is very high in fiber, potassium, calcium, folic acid, iron, zinc, protein, B vitamins, and tryptophan, the amino acid that helps calm stress and anxiety. It has a low glycemic index (below 50) and is very high in antioxidants. Fresh ramon seeds can be eaten raw, boiled like potatoes, or set out to roast in the sun to be eaten later.. The dry seed can be ground into a meal for porridge or flatbread. Ramon seeds do not contain tree allergens like almonds, walnuts and pecans. The leaves or powdered nut make a tasty caffeine-free tea. The sap from the tree was used by the Mayans to cure stomach and digestive problems.